One of the most important sparklers in Norway, Queen Maud's pearl tiara, graced the heads of two generations of Norwegian royal ladies. It would inevitably have crowned a few more, too -- if only it hadn't been involved in a rather notorious jewelry theft! The original pearl and diamond tiara that belonged to Queen Maud (pictured at left) was given to her by her parents, King Edward VII and Queen Alexandra of the United Kingdom, when she married Prince Carl of Denmark in 1896. It is often reported that the tiara was commissioned from Garrard, then the official royal jeweler in Britain. The piece was a lovely wedding gift for a princess joining another royal clan, but it was never intended to become a central part of another royal family’s jewel collection. Maud unexpectedly became queen of newly-independent Norway in 1905 when her husband was chosen as the country’s new monarch. She wore the tiara, which has a large detachable central element, until her death in 1938. 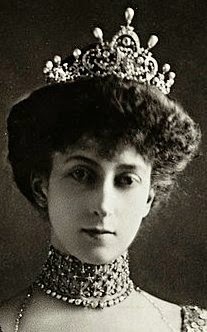 Maud’s son, King Olav V, inherited the tiara from his mother, but it was a long time before he was reunited with the tiara (and the rest of his mother’s jewels). Maud had taken her jewelry with her to Britain for a visit in the autumn of 1938, and she unexpectedly died while she was abroad. The late queen’s jewels were kept safe in Windsor Castle for another fifteen years, for the duration of World War II and beyond. The Norwegians were finally able to reclaim the tiara in 1953, when they visited Britain for the coronation of Olav’s cousin, Queen Elizabeth II . Olav’s son, King Harald V, is the current owner of the tiara; he received it when Maud’s jewels were divided following his wedding to Sonja Haraldsen in 1968. Sonja wore both the large and small versions of Maud’s original tiara until 1995, when tiara tragedy struck. The piece was sent back to Garrard in London to be cleaned, and while it was there, it was stolen. The theft revealed the approximate value of the tiara at the time: $312,000 . It has never been recovered. Garrard made a perfect replica of the original pearl and diamond tiara for the family, and that’s the tiara that Sonja has worn ever since. The photograph above shows her wearing the full version of the new tiara at a gala dinner in 2003. 3. See historian Trond Noren Isaksen's blog for more. 4. Here's a news report from an American newspaper about the robbery. 5. A version of this post originally appeared at A Tiara a Day in June 2013.